Please keep in mind that a solar water heater supplements and preheats your existing water heating system to reduce your utility bill. Because of cloudy days, you will always need to have a full backup system in place. In the summer, with the sun high in the sky and fewer clouds, solar systems provide more energy per month than the cloudier winter season where the sun is much lower in the horizon. 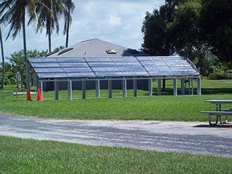 Everglades National Park, Florida – Four collector systems with twelve 20-01 collectors and four 80 gallon tanks each. We need to know how many Btu’s you need to be supplied. This can be established a number of ways. Find out how many Therms or, if Electric, how many kWh you are using to heat water. If your water heating is not monitored, you can often get an idea of consumption with Gas or Propane by looking at your non-space heating season bills, usually, the cost to heat water is 80 to 95% of this bill. If Electric, your spring or fall, non-heating, non-cooling bill will be your lowest bill and 50 to 70% of this bill can be your cost to heat water. In both cases, it depends on what other uses for energy you have for the fuel. An example of another way would be for an apartment or Hotel/Motel with consistent 7 days a week usage. Figure 10 square feet (s/f) of collector area per person day of usage. A motel with 100 rooms occupied an average of 75% of the time by one person to a room may need a 750 s/f system. This would also cover the laundry. If the Motel has a large restaurant with lots of dishes, a larger system may be needed. A lot of times the system size is limited by available space for collectors and or storage, or simply by budget. This limitation may cause the system to be smaller but smaller systems can be a very cost-effective Green investment. If you want us to give you an idea of savings, we also need location and your cost of energy in Therms or in kWh. We also need to know your usage patterns and what the water is used for. You need the collectors to face the sun so you need a good, unshaded, southern orientation (if in the Southern Hemisphere, a good Northern orientation) We need to know how your system will be installed. Be sure to take your orientation readings from True South, not magnetic. Tilt angle is important. The higher the collectors are tilted (from horizontal) the more winter collection they will achieve and the potential for summer overheating is reduced. We need to know if you have a flat roof or a tilted roof and we need to know the material. Pictures are very important for us to help you with this. You need enough space for storage. Depending on your situation, you will need from 1 to 2 gallons of storage per square foot of collector area. Again, pictures are very important for us to help you with this and we need measurements. Most areas require a heat exchanger but some warmer coastal areas can use open loop systems. You need a good pipe run. You need to be able to connect the collectors to the tank or tank heat exchanger so you need to establish that a pipe run can be made and how long it will be. Depending on the number of collectors used, the pipe size will vary greatly from 1/2″ to 3″. We need to know the length of the pipe run. Local code, Permits and other issues including roof warranty need to be considered. Cost: Commercial systems “rule of thumb” cost is based on installed cost per square foot (s/f). In general, smaller commercial systems cost more per s/f per day than larger ones. A solar thermal system can produce up to 50 watts of thermal power per s/f where a PV system can typically produce up to 15 Watts per s/f. A typical residential installed system costs $160 to $240 per s/f so commercial systems go down in s/f cost as their size increases. Larger installed systems on average cost from $100 to $220 per s/f installed. 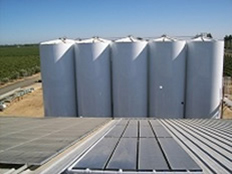 The lower end is for simpler installations or self-contracted installations. The higher end is more complicated jobs and or for Prevailing Wage jobs which adds usually 25 to 30% to the installed cost. Typical non Prevailing Wage commercial solar water heating installations over 800 s/f cost between $120 and $160 per s/f installed depending on the level of difficulty. We give basic design help and draft estimates to customers on the above at no charge. More extensive design work, drawing, and plans are done at an Hourly or Job rate. We look forward to helping you cost-effectively Go Solar!